Several production methods are used in batch bioprocessing, but the general concepts are conserved across reactions. Bioprocessing refers to the production of biopharmaceutical products by using cells to produce desired proteins. Biopharmaceuticals range from monoclonal antibodies to enzymes and blood factors. A batch manufacture process consists of a single cell culture containing the necessary nutrients for recombinant cells to produce therapeutic proteins. The products are harvested only once from each batch, making this a labor-intensive process to carry out on a large scale. The cell culture and harvesting steps compose the upstream portion of bioprocessing, which is followed by the downstream portion: isolation and purification of the biopharmaceutical. Inoculum is prepared from a cell bank in advance and added to a batch bioreactor. To produce the necessary number of cells, the batch is expanded in successively larger bioreactors until the cell culture is large enough for sufficient bioprocessing. Products are then separated from other cellular components by centrifugation. Manual operation is required in the upstream portion of batch bioprocessing when operators must move cell cultures between bioreactors. Variability in the timing and handling of cell cultures can result in failed batches, reduced productivity, and inconsistent results. 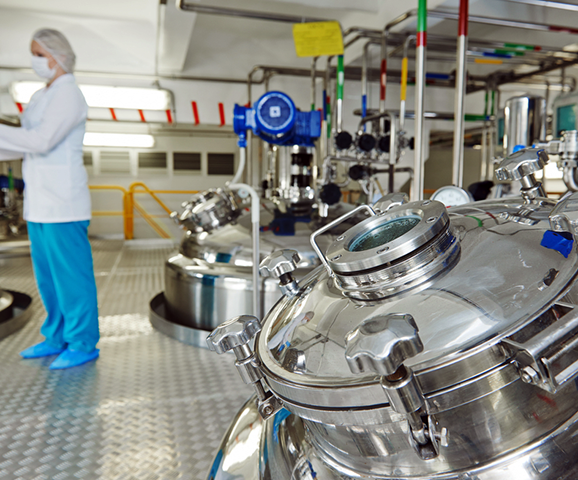 Batch bioreactor processes have the potential to be significantly streamlined with automation. Automation practices and technologies minimize the risk of human error and improve product consistency and quality. The cost of the equipment needed to grow successively larger cell cultures is immense, and shifting to continuous bioprocessing is associated with a significant reduction in operating and machinery costs. Batch cultures can suffer from depleted glucose concentrations early in the process, thereby pushing cells into consuming lactate and ultimately lowering cell viability and product yield. Fed-batch bioprocessing supplies cells with a more constant source of nutrition, although this method may not be as effective as continuous perfusion cultures. In some cases, the single-batch model allows for too much degradation of sensitive products like enzymes and blood factors. When products are harvested only once, a large portion of the protein product has had plenty of time to be exposed to proteolytic pathways. Degraded and unstable products have harmful results for downstream processing, reducing homogeneity and quality. After isolating products from other cellular components via centrifugation, the purification process begins. This process consists of several steps that eliminate unwanted byproducts and contamination. Chromatography is used to bind either the biopharmaceutical, which can then be eluted and further purified, or the contaminants, which allows the product to be isolated. The downstream challenges of batch bioprocessing are, in some ways, similar to the upstream challenges. The purification process is often comprised of several steps that requires trained technicians. The costs of employment, as well as the potential costs of mistakes, are both critical factors to consider in a bioprocessing setting. Batch, as opposed to continuous, bioprocessing must be completed in entirety before another batch can be made. This has advantages in terms of limiting mutations in a cell line as well as offering a degree of flexibility in a facility's production schedule. However, if large-scale production of unstable biopharmaceuticals is the goal, batch bioprocessing significantly limits high-quality output.